A recent report by travel expense solution provider Certify highlighted how ride-hailing, mainly Uber, has now, allegedly, overtaken car rental as a mode of transportation for business travelers in North America. The report has created some buzz having been picked up by news outlets as diverse as Bloomberg and the Daily Mail, the latter actually publishing its article under the rather sensationalist heading “Uber is killing off the car hire: Business travellers now use app for transport more often than renting their own car”. As this is being framed as a battle of Uber vs car rental, is the full story being told? The below chart shows the trend as identified by Certify for the period Q1/2014 to Q1/2016. On the surface there seems to be 1 winner, ride-hailing, and 2 losers, being taxi and car rental. However, if one starts digging a bit, it seems a fair assessment that the evidence is more circumstantial than conclusive. The main reason for this is that it is exclusively based on the number of expensed transactions through one solution provider. Based on this measure, the mechanics of the business models in such a comparison favor the ride-hailing segment, which will be shown below. As such, it seems a fair assessment to assume that it does not represent a complete picture. If one uses a ride-hailing service instead, this would equate to 3 transactions. If one considers a 2-day rental then, it could look something like this. What about the operators themselves, can they shed some light on the situation? Both Avis Budget and Hertz recently published their financial results for the first quarter of 2016, including operational metrics such as volume. Do these figures show the same trend as Certify? Considering the regions falling into the scope of the Certify perimeter (the US for Hertz, Americas for Avis Budget), there was volume growth for both the operators. However, there was no breakdown between the commercial and leisure segment. It is worth noting, however, that both companies referred to softness in the commercial segment during the quarter in their respective earnings calls. However, given that American Airlines made the same remark in its Q1/16 earnings call, it seems to have been more of an overall travel industry issue than simply ride-hailing operators taking a bite of the car rental operators’ business. Thus, there was limited conclusive evidence either way coming out of the operators. Once more, this is not evidence that commercial clients seek other solutions, it is more a reflection of changing corporate priorities and market dynamics. Hertz acquiring Dollar Thrifty, a leisure focused brand, and expanding its deep-value brand Firefly are examples of this. Also, it is important to remember that the US car rental market, by far the largest in the world, is growing. According to Auto Rental News, the market grew by 4.2% in 2015. Much of that growth, though, was captured by market leader Enterprise, whose growth was estimated at 8.0% (Enterprise being a private company, the only publicly available financial data is consolidated revenue, incorporating all its activities, not limited to car rental operations, so car rental revenue represents an estimate). Thus, this is not an industry that seems ready to give in just yet. 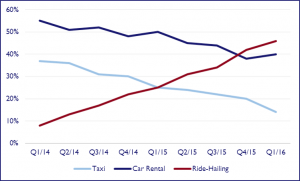 To conclude, evidence of ride-hailing taking business away from the car rental industry is circumstantial, but not conclusive, at this point based on available data, at least with regards to the actual amplitude of a shift. This is not to say that car rental operators can rest on their laurels and assume things will continue as they have in the past. They will have to adapt their offering to a new environment, including new competitors, but one can expect car rentals to remain an important part of business travel for the foreseeable future. As an end note, it is worthwhile keeping in mind that the main beneficiary of the Uber vs car rental battle is the consumer (the business traveler in this case) who can access new, generally cost-effective, solutions offering better choice and more flexibility, thus improving the travel and mobility experience. This trend is likely to continue. Accordingly, Uber vs car rental, round 2 and beyond is coming to an airport near you!